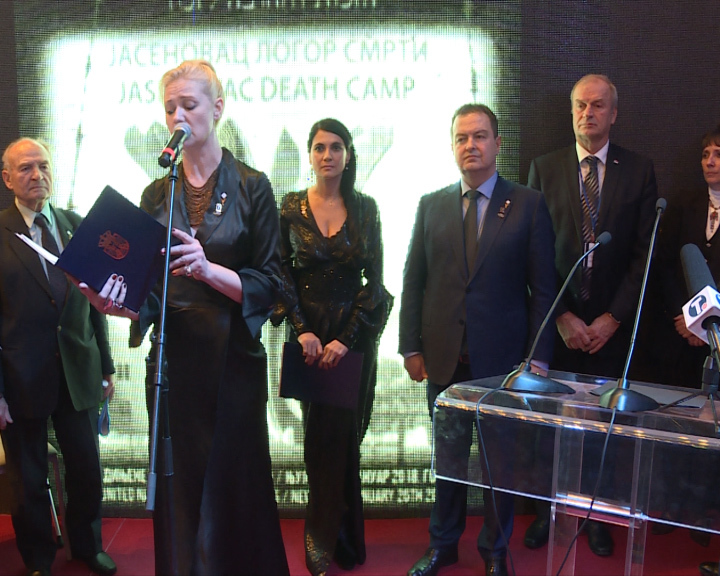 On Thursday, January 25, 2018, His Excellency Serbian Foreign Minister Ivica Dacic opened “Jasenovac – The Right to Remembrance” Exhibition at the United Nations in New York City. Present for the opening were His Grace Bishop Irinej of Eastern America, Their Excellencies Ambassador Djerdj Matkovic of the Embassy of Serbia to the United States of America, and Ambassador Extraordinary and Plenipotentiary Milan Milanovic, Permanent Representative of the Republic of Serbia to the United Nations, as well as the Honorable Consul General of Serbia for the United States, Mirjana Zivkovic. Numerous members of other Diplomatic and Consular Corps were also present, as well as academics, artists and other dignitaries. Most notable was the presence and living testimony of survivors of fascist-operated concentration camps in the Independent State of Croatia during World War II, including those incarcerated in children’s camps.